Immediately following World War II Bolens was acquired by FMC Corporation and specialization continued in production of outdoor equipment. A progressive engineering program was begun and new designs met growing new demands as Americans in increasing numbers discovered Bolens power equipment as a means of reducing the time and effort required for yard care. In 1947, Bolens introduced the first compact tractor. The Husky 600 made its appearance in 1961 and set a new standard for all compact tractors. Bolens again startled the industry in 1963 with introduction of the Estate Keeper; a unique and years-ahead concept in compact tractors. Each product bearing the Bolens trademark is backed by this 150 year heritage, and by the extensive research and development facilities of FMC Corporation. Today, as in the past, the name Bolens stands for proved dependability, advanced design and the highest standard of quality. Originally started as a joint partnership as you will in Port Washington, Wisconsin the earliest of the Bolens company was actually the J.E. Gilson/ H.W. Bolens Manufacturing Co. working together making chair irons and garden tools. Gilson sold out to Bolens in 1914 and went seperate path. Bolens from that point on had become the worldwide leader in the manufacturing of Outdoor Power Equipment. Located in the same building since 1894 they went on to invent and make the world's first self contained four wheel riding garden tractor, the first mulching mower design that is still patented to this very day and one of the first hydrostatic transmission implemented on a garden tractor (Bolens Husky 1250). The biggest misconception of the Bolens Company today is that they are out of business. That is entirely false. The Bolens company is still a very active company today, under the Garden Way Troy-Bilt name, they are still the same. Garden Way purchased Bolens in 1988 and purchased TroyBilt sometime before that. Although all of Bolens equipment is under the Troybilt name, let me assure you that the tractors and mowers are of Bolens design and standards. TroyBilt makes tillers and accsessories...Bolens makes the garden tractors, the same way they always did, cast iron shaft driven transmission, pto driven deck. One other thing to ad about the history of Bolens is that Bolens was bought by the FMC corp in the late 40's. FMC acually made the Ride Master and then bought Bolens. I think that they left Bolens as the main name because the Bolens name was so well known. Also I think that Colt had the first hydrostatic transmission in 63 or 64. 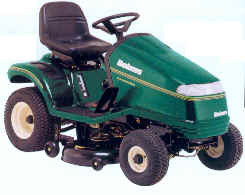 Garden Way, that owned Bolens and Troy Bilt since 1993, was sold to MTD Products in Summer 2001. MTD seem to keep the low end Troy Bilt models; the same that was sold with the Bolens name in Canada from 1999 to 2001 and in Europe.